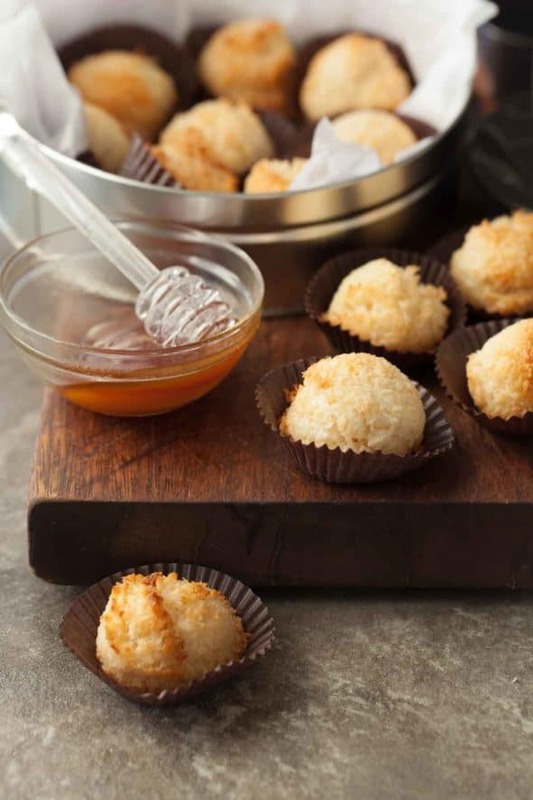 These coconut macaroons are soft and chewy with the sweet taste of honey. I think we’ve probably all had at least one bad experience with those misshapen, heavy and tooth-achingly sweet confections that pass for coconut macaroons at least once. You know the kind whose cloying sweetness hits you over the head at first bite and whose flavor is barely reminiscent of coconut. A good macaroon however is quite the opposite. 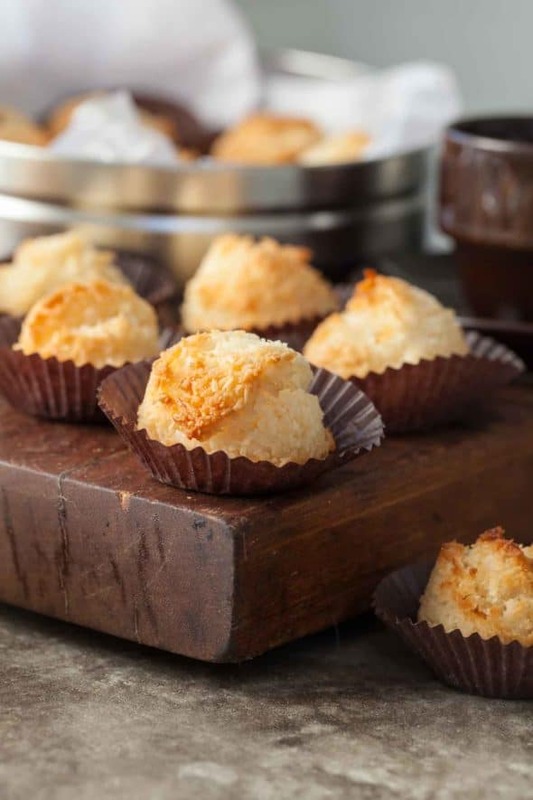 The French call their coconut macaroons rochers à la noix de coco or congolais and they are an altogether different breed from the toothaching varieties. 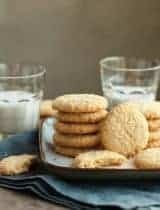 Baked until lightly golden on the outside, but still creamy white on the inside they are bites of pure coconut goodness. A good coconut macaroon stricks a fine balance; it’s at once light but chewy , a little crispy around the edges, but with a soft, tender interior. It has a pure clean taste that’s all coconut and just lightly sweet and only takes a matter of minutes to make. Made up of a few kitchen staples, the difference lies mainly in the technique. While coconut, egg whites and sugar makes up the base of most coconut macaroons I’ve used honey instead for a naturally sweetened version and for it’s mild almost floral taste. The key to these however is to gently heat the egg whites, honey and coconut mixture over simmering water prior to baking it. This allows the mixture to partially cook and the coconut to fully hydrate before it goes in the oven allowing for a shorter cooking time at a high heat. The short baking time in a hot oven ensures that the macaroons get crispy and golden on the outside while keeping the centers nice and moist, and that is what makes all the difference. I couldn’t resist melting a little chocolate for dipping but it isn’t required. The combination of chocolate and coconut does make for an extra special treat. You can dip the bottom of each in chocolate and let them set or just drizzle it across the top. Combine all of the ingredients except chocolate in a large heatproof mixing bowl. Set the bowl over a saucepan of barely simmering water. Stir the mixture for 6- 8 minutes until very hot to the touch and has thickened. Using a small cookie scoop, place mounds of batter on parchment lined baking sheet a few inches apart. Bake until lightly golden around the edges,(about 7-10 minutes) roating sheet halfway through (if tips are browning too fast, lower the heat 25 degrees). Let cool completely on wire racks. 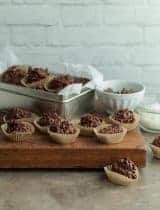 The cookies are best on the day they are baked, the crispy exterior will soften but they can be stored in an airtight container for up to 5 days. If making chocolate dipping sauce, place half the chopped chocolate in a medium heatproof bowl set over a saucepan of simmering water and stir until melted. Remove bowl from heat, let stand for a few minutes to cool then stir occasionally the remaining half of chocolate until smooth. Dip the bottoms of each macaroon into chocolate, let excess drip off, and place on parchment to set (about 1 hour). Store in airtight container at room temperature. Wow, absolutely gorgeous Sylvie!!! I know what you mean about those old style macaroons, but these look amazing! This was a very good read. I have never made macaroons and there is such a variety of recipes out there. However, your comments here have narrowed down some things. I like the use of honey instead of sweetened condensed milk. I am saving this recipe for when I do make macaroons, you have me convinced these are a winner. Thanks for sharing. These look delicious. Your photography always inspires me. Tooth-achingly sweet...yep, that's a good descriptor for many macaroons. Yours are just beautiful! These look quite delicious, Sylvie! And, the photos are stunning. These sound just lovely. The photos look so delicious I want to step through my screen and eat every last one! Stunningly beautiful!!! I need to try this version...I love all things coconut! Macaroons may be one of my favorite things in the world. I have always been a coconut fan and the texture of macaroons in just fabulous. Love this sophisticated take. Looks marvelous! Love these. I've made mine with honey before, but I added orange zest, too. Absolutely lovely, Sylvie. Coconut macaroon fondue--how brilliant and sinful! I just love coconut macaroons. And they are so much easier to make than the regular macarons. We love chocolate covered macaroons in this house. There is just something so satisfying about a macaroon. I just can't stop at one though! Gorgeous and delicious Sylvie!!! I could eat them all!! These look wonderful, Sylvie! I love the addition of honey! My favorite is the texture! Great combo! Oh Sylvie, this is a wonderful combo. I love the texture of coconut! Adding honey is a wonderful thought! Beautiful, beautiful dessert! Sylvie, if in posted three comments I am sorry! I was having trouble. In any case, if you haven't seen it already, these look amazing. I love he addition of honey. The texture of macaroons one of my faves! It sounds as though you have put together the perfect macaroon. Adding honey as the sweetener, rather than sweetened condensed milk, sounds so much more appealing. I would think the honey wouldn't compete with the natural sweetness of the coconut. Great post, Sylvie! Aww Sylvie I love coconut macaroons and can see how pairing it with chocolate sauce would work wonders. Long time my friend. Oh my, beautifully made and beautifully shot, Sylvie. 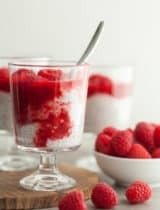 I love this recipe and love how it's not overly sweet. Not sure why I've never tried macaroons but when I do, it will be this recipe. Thanks for the guidance. I didn't know that I liked coconut until I tried real, unsweetened coconut! I have a recipe for chocolate-dipped macaroons on my blog that I adore. Yours look just as delicious. I do so agree about over sweet, cloying macaroons - however I'm sure these little beauties are a million miles away from that. Gorgeous. Honey? Coconut? Chocolate? What cold be better?!? :) I already have some unsweetened, flaked coconut, and now I know just the thing to make with it! Such beautiful images! I don't think anyone would ever confuse these with those canned macaroons - these are just stunning, Sylvie! I love that final photo with the macaroon-filled coconut half and bowl of thick, molten chocolate. Absolutely gorgeous. 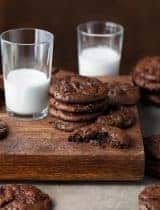 I agree with all these comments, especially those readers who want to dive into their screens to eat your macaroons and bath in the chocolate dipping sauce :p I think I'll make some of these using fresh coconut, finely shredded in my Thermomix. I'll let you know how I get along! I can't wait to make this. Probably this weekend. Sounds too good to not try! I adore the opening shot. MUST make these!!! They look like delightful little bites. Oh my goodness!! Gorgeous macaroons. They sound and look like they could melt in your mouth. Macaroons are so tricky but worth it in the end when you get them right. The only thing you need is a buddy in the kitchen when you're making them, simply for the high five when they are a success. 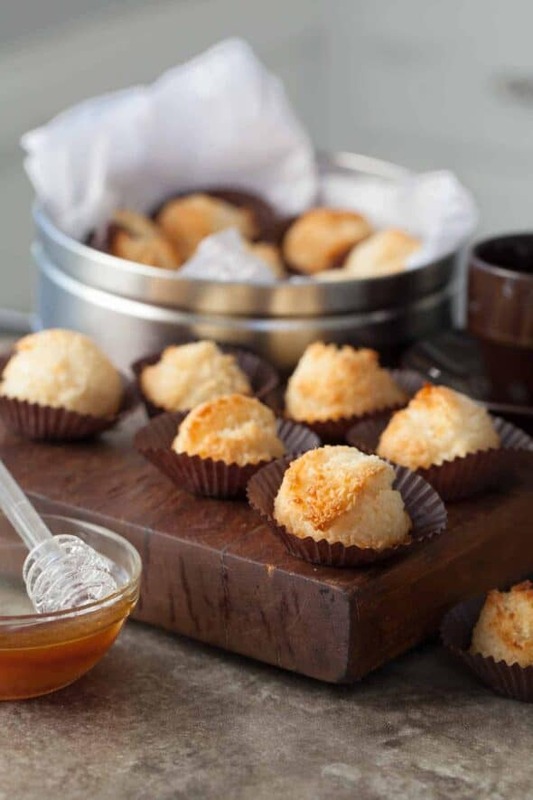 My dinner is just over and am craving to go back to my kitchen and start making these tiny macaroons..wish you were near to share a few with me. What gorgeous pictures..love that coconut click. Aaaah, I grew up with macaroons (as opposed to the current obsession with macarons!) and you are right - the best ones were the ones that were not too sweet, crispy on the outside but still creamy on the inside. And of course there had to be chocolate involved :)) lovely post! Oh my god, I love you. This looks like the perfect macaroon! :) Coconut macarons are an absolute must at my hosue each Christmas, but I'll have to suggest the honey twist! Really beautiful photos and great tips to make macaroons the right way. I really love the shape and texture of these little guys. These! Love them and the coconut/chocolate combination. Lovely snaps too! My husband can never get enough of Coconut macaroons . His all time favorite! Love the snaps and the tone. I also don't like cloyingly sweet macarons--I think these would hit the spot perfectly. I also had a big craving for a coconut treat this weekend so I made something up but it's definitely not as lovely as these little guys are. Love the way you presented them. these are absolutely gorgeous. i just want to reach through the screen and take a few. beautiful! Sylvie, These are just gorgeous and I know they are going to taste amazing! 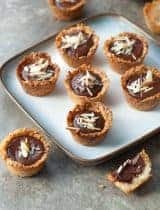 Coconut and chocolate are one of my favorite combinations and I can't wait to make these!! I love the recipe and photos. You are so talented! They look lovely. I didnt know you could make them with honey! Your photos are stunning, and mouthwatering! Love the recipe! !Congrats on FBuzz top 9!!!! Such dainty looking coconut macaroons. I love the elegance in your description and photography. Inspiring. I've been using coconut milk in place of milk in lots of recipes, Sylvie. We just love the flavor. Both your macaroons and sauce are loaded with coconut! Such a cute idea to place them in a halved coconut to present. Yummy! Congrats on the Top 9! Your pictures are just stunning. I am sure that these macaroons are just delicious because they sure look it! I love macaroons. I have good childhood memories of them, but these would probably pale those memories. I love anything with coconut. These look and sound delicious! I love that you used honey in place of sugar. Will definitely have to try these soon! These are just gorgeous!! I'm a coconut lover, so I know I'd love a few of these! They look sensational. I want some right now! Those are the sweetest little macaroons I've seen yet, and your description makes me want some so badly! I have a question...where do you find unsweetened shredded coconut? Whenever a recipe calls for it, I can never find anything but sweetened. oh i have SUCH a weakness for macaroons. Never tried making them with honey though so that is definitely going on to my list of "must tries". And the chocolate sauce is a definite must! You are so right - there are macaroons, and then there are macaroons. These look just superb! Gorgeous photos as always too. Congrats on top 9! These are not only brilliant, they are absolutely gorgeous to boot. Delicious! I've tried a rather huge egyption-like pyramid of these before and it was golden on the outside and creamy white inside, my only critism was that it was soooo huge that I was a little 'over' the coconut flavour by the end. Yours delightful balls of coconut deliciousness look like just the answer thought with their bite size, well, size and I am looking forward to trying them. These are delightful Sylvie! Typically these are over sweet and I don't care for them, but you version is wonderful :) As the photos are as well! I made coconut macarons from Dorie Greenspans's recipe once and they were gorgeous too! 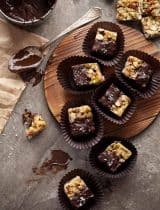 With silky caps of chocolate. Your look so petite and perfect for tea! 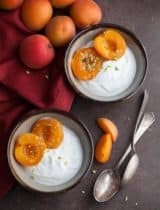 Love this recipe, and such stunning pics too! tried making these today. Recipe sounds delish. So does the chocolate sauce. I made both... The chocolate sauce was good, but I did have to add a little bit of powdered sugar to make it sweeter. Before the powdered sugar, it was kind of bland. I'm thinking this maybe the cocoa powder I used, but I'm not sure. As for the macaroons....I'm not entirely sure where I went wrong with the recipe. I followed it to a T, and also redid it with another type of honey. The macaroons fell apart, I could not get them to roll into a ball at all. I used bob's red mill unsweetened coconut. They did not stick together at all, instead I had a coconutty mess on my cookie sheets. Last gripe....baking at 400F. They began to burn after 5 minutes. I took them out and decided to try another recipe for my passover meal. Any suggestions to what happened with all these missteps? 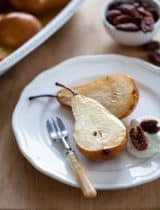 I found this while looking for a Passover dessert recipe I could make (without the chocolate)for family members who are on the GAPS diet. What a hit!! Even with the 9 year old twins who can eat everything and are pretty particular about what constitutes delicious. Now all three households have the recipe and my daughter and I have made them many times. They're quick, easy (once you get the hang of rolling them) and everyone thinks you've fussed for them. Thank you for creating this amazing treat! That's fantastic, I'm so glad to hear that they were a hit with your family! I love your recipes!. This one looks real good!.